Missoula, Montana, is not exactly the greatest tourist destination at this time of the year, but the Hawai’i basketball team is still there in search of a priceless souvenir it can bring back home – a win. The Warriors will play a non-conference road game at Montana on Saturday (4 p.m. Hawai’i time) at the Dahlberg Arena in Missoula. Indeed, the Grizzlies are one of the leading candidates to represent the Big Sky Conference in the NCAA Tournament, as they are 19-6 overall and a half-game out of first place in the Big Sky at 12-1. They are on an eight-game winning streak (all against Big Sky opponents), and have won 14 of their last 15. 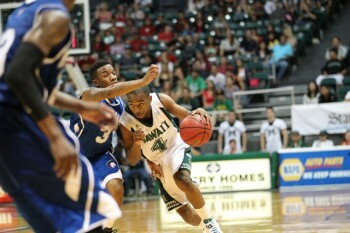 Hawai’i is 15-10 overall, including 4-4 in road games. Like Arnold, Montana head coach Wayne Tinkle does not like the timing of the game. In addition to playing at home, the Grizzlies have also had the advantage of rest. The Warriors won a home game against New Orleans on Tuesday, then departed for Missoula on Thursday night. Meanwhile, the Grizzlies’ last game was on Saturday, so they have had a week at home to prepare for the Warriors. Like the Warriors, the Grizzlies have decent size and balanced scoring. Montana’s top scorer is Will Cherry, a 6-foot-1 junior guard who is averaging 15.8 points and 4.1 rebounds per game. However, he is not the only threat. Kareem Jamar, a 6-5 sophomore, is averaging 13.0 points, 5.2 rebounds and 3.4 assists per game. In the post, the Grizzlies have two options – 7-foot senior Derek Selvig is averaging 9.4 points and 6.4 rebounds per game, and 6-7 junior Mathias Ward is contributing 10.0 points and 3.9 rebounds per game. Hawai’i junior center Vander Joaquim recently took over the scoring lead for the Warriors. He is now averaging team-highs of 14.8 points and 9.9 rebounds per game. Senior guard Zane Johnson is averaging 14.6 points per game and leads the team with 71 3-pointers. Junior forward Joston Thomas is contributing 14.1 points and 5.8 rebounds per game. Junior Hauns Brereton is averaging 13.0 points over his last six games. Ostrowski is averaging 6.6 assists per game. The Grizzlies are 10-2 at home this season, and are drawing an average of 3,091 fans per home game. WAC leader Nevada defeated the Grizzlies in Montana, 70-64, on December 10. I believe Gib was looking at Kareem Jamar out of high school. Jamar was on a super talented team that included Dwayne Polee, Reggie Murphy & that guard Corey something. They all went to Westchester. He would have been a nice get for us, oh well.